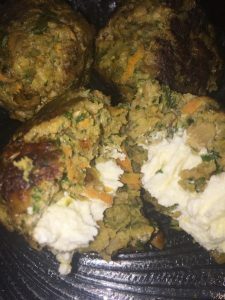 When I made these meatballs recently I just knew I HAD to share the recipe with you. They are SO good, and the recipe makes enough to either serve 8 people, OR make some and freeze some! When my husband took some for work people were immediately asking him for where I got the recipe. They are SO good, and are just loaded with veggies. They really eat like a meal all by themselves, but you could easily top them with a favorite sauce. These meatballs are just loaded with veggies and then stuffed with cream cheese. You can easily eat them like a meal, but they'll also taste good with your favorite sauce. Gather the onion, celery, and kale. Wash and prep them and then either dice them as fine as you can, OR put them in a food processor for a quick buzz. Wash carrots and grate fine. Cut cream cheese into 24 cubes. Mix the veggies, meat, eggs, oatmeal, and any spices and mix well. Take a ball of meat about the size of a half dollar and make a patty. Place a cream cheese cube in the middle, and fold the patty around it to conceal it inside. You should be able to make 24 meatballs. They will be generously large. To Freeze for Later: Place Meatballs on a sheet pan, making sure they do not touch and place in the freezer. When they are frozen solid place them in a ziploc bag and label for later use. To Cook: Saute in skillet with a little oil. After browning add 1/4 cup water and 1/4 cup soy sauce, then gently place lid on top. Simmer until cooked through. To Bake: Place in 350 degree oven for about 30-45 minutes until cooked to 160 degrees. You can also brown them on the stove first and then bake them in the oven to temperature. To Cook in the Instant Pot: Saute meatballs in some oil to brown. Remove from pot, and place the trivet in Instant Pot and add 3/4 cup of water and 1/4 cup of soy sauce. Layer the meatballs on the trivet. Cook on manual for 7 minutes. Let pressure naturally release for 5 minutes and then release remaining pressure. 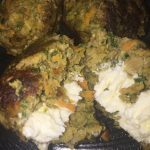 When cooked in the Instant Pot my meatballs did burst open some. Still tasted great, but looked a little less amazing. The meatballs in the photo were browned on the stove in a cast iron pan. Then a lid was put on and they were cooked in the soy sauce and water mixture in the oven until cooked to temperature.